Lauren Brant baby: She's just given birth to a baby boy. Lauren Brant and Barry Hall just welcomed a baby boy. 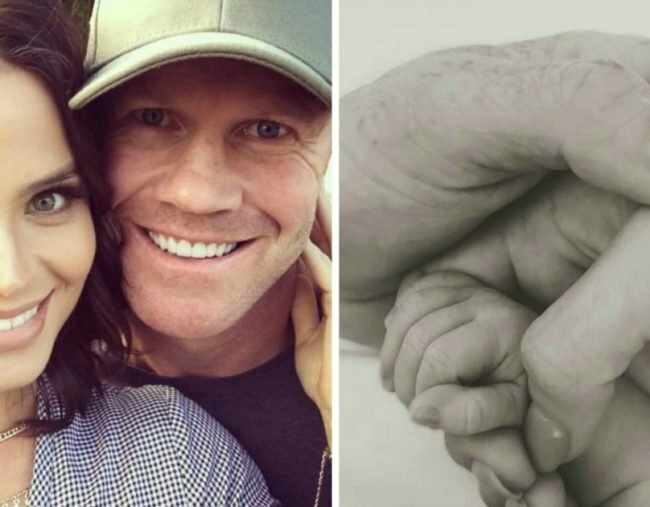 Former Hi-5 star Lauren Brant and AFL legend Barry Hall have welcomed their first child, a baby boy, one week before the expected due date. In an Instagram post on Tuesday afternoon, Brant shared a black and white photo of three hands – hers, Barry’s, and her newborns, alongside the caption: “Our world is now perfect! Welcome to the world our little man Miller Hall”. Hall then shared the photo on his account, with the caption, “Well it’s the news I’ve always wanted since I can remember!! I’m going to be a DAD! “I’m so excited not only to have my first child but to have it with such a beautiful caring woman who I love dearly. She will be the best mum, I can see it already. Can’t wait for the arrival”. Hall and Brant became close during filming for I’m a Celebrity, Get me Out of Here! but didn’t pursue a romantic relationship until over a year later. Speaking to New Idea late last year, Brant said, “We’ve both been in serious relationships and we have both always wanted to be parents, but the time has never been right”.